The newest way to personalize a family name or meaningful word using letters of the alphabet, seen from a different perspective. Customize your own framed art by choosing from one of a kind photographs of letters you've taken. Get 4×6 unframed photo prints for $2 each. 1 code per order. Minimum 5 prints. Includes free shipping to the contiguous US. Get 59% off your orders. While supplies last. Get two Gallery Block frames for $109. Get Gallery Wraps for $45 each + Free shipping to US 48. Limit 3 per order. Limit one coupon, voucher, promotion, gift certificate, or discount per order and cannot be combined with closeouts or bulk sales page. 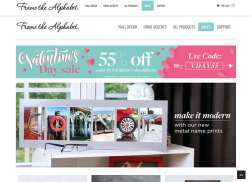 Get Overstock Country Ash Framed Name for $52 + Free shipping. Limit 3 per order. Get $10 off $30 or more + Free shipping to the contiguous US. Get stationery for $25 + Free Shipping. Get Letter blocks for $6. Get Stationery for $19 + Free Shipping. Get MyPhoto Series Prints for $18 + Free shipping. Get $35 off $75 or more + Free shipping to the contiguous US. Get Engraveables – Ornaments for $9 each (Regular priced $26). Get $15 Off + Free shipping for stationery, regularly priced at $40. Get Country Sky Blue framed monogram for $20. Limit 3 per order. Get Ornaments for $5 each. Maximum 2 per order.